A stunning take on the traditional bath mat, this new floor mat incorporates the rich, warm tones of pure, solid, natural Teak wood crafted in a very modern, uber chic design that exudes style. This is the ideal accessory for our dramatic, dark, pencil-lead Purescape 748 bathtub, as it reflects the same interpretation of function in cleverly designed and beautifully rendered form. 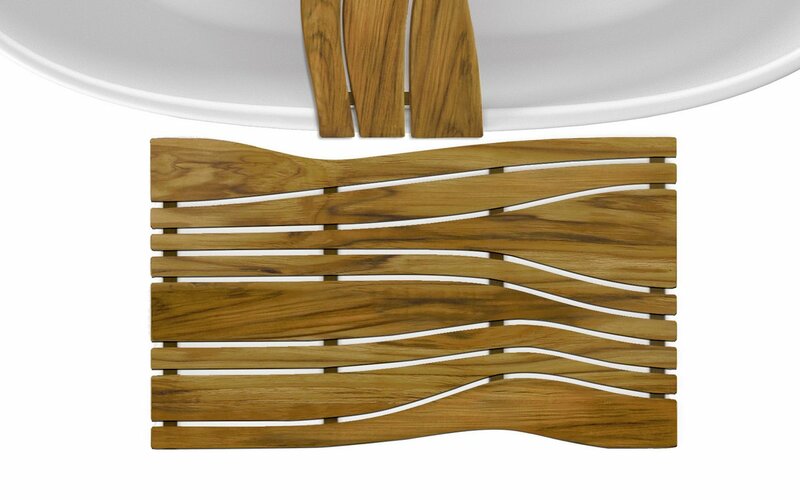 The asymmetrical curves of the deep (0.75” / 2cm) slatted wood top echo the sinuous curves of the bath. The solid feet ensure balance and excellent drainage. The overall size – 33.5” x 19.75” (85 x 50 cm) gives you plenty of room to move, as you towel off after your relaxing soak. The wood used for this mat is 100% natural and has been treated with a teak oil to ensure waterproof impermeability and long life. It drains and self-dries freely. Of course, this delightful Onde bath mat works equally well with any other Aquatica tub of your choice. A stunning take on the traditional bath mat, this new floor mat incorporates the rich, warm tones of pure, solid, natural Teak wood crafted in a very modern, uber chic design that exudes style. This is the ideal accessory for our dramatic, dark, pencil-lead Purescape 748 bathtub, as it reflects the same interpretation of function in cleverly designed and beautifully rendered form. 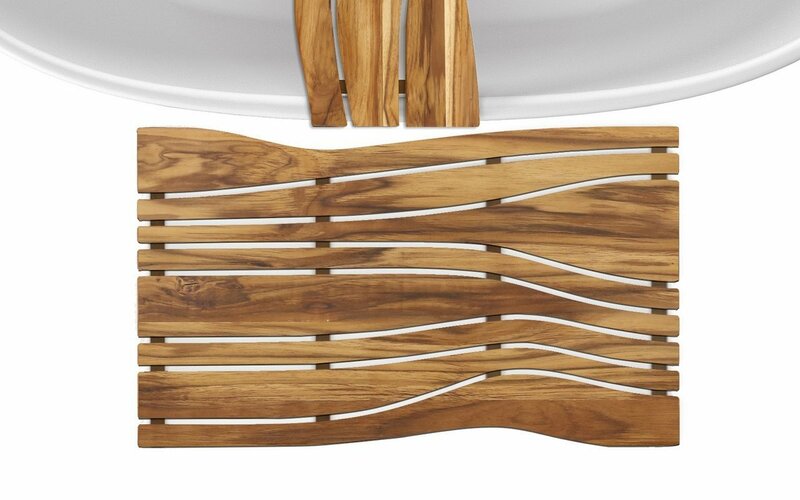 The asymmetrical curves of the deep (0.75” / 2cm) slatted wood top echo the sinuous curves of the bath. The solid feet ensure balance and excellent drainage. The overall size – 33.5” x 19.75” (85 x 50 cm) gives you plenty of room to move, as you towel off after your relaxing soak. The wood used for this mat is 100% natural and has been treated with a teak oil to ensure waterproof impermeability and long life. It drains and self-dries freely. Of course, this delightful Onde bath mat works equally well with any other Aquatica tub of your choice. 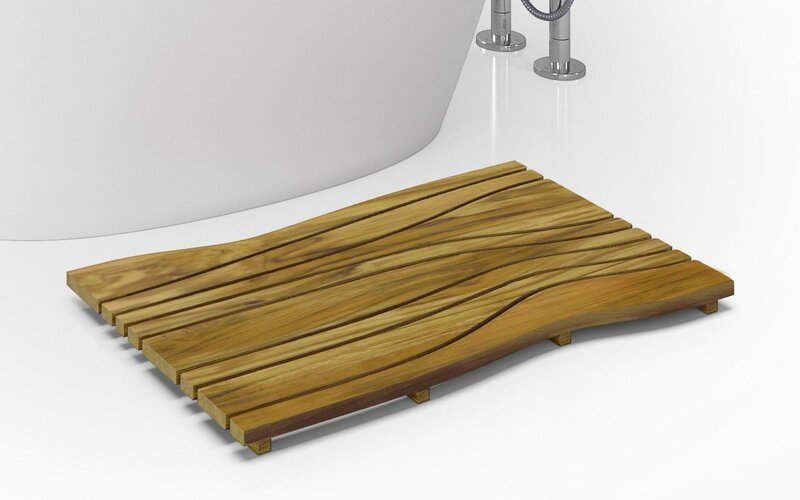 This lovely solid wooden floor mat has been designed as the perfect addition to your unique bathing experience. The purity of the design reflects its functional heritage. The simplicity of the detailing, the subtly curved top and wonderful grain of the wood combine to create an object of lasting beauty. The origins of the teak wooden floor mat lie in hand-crafted artisanship. 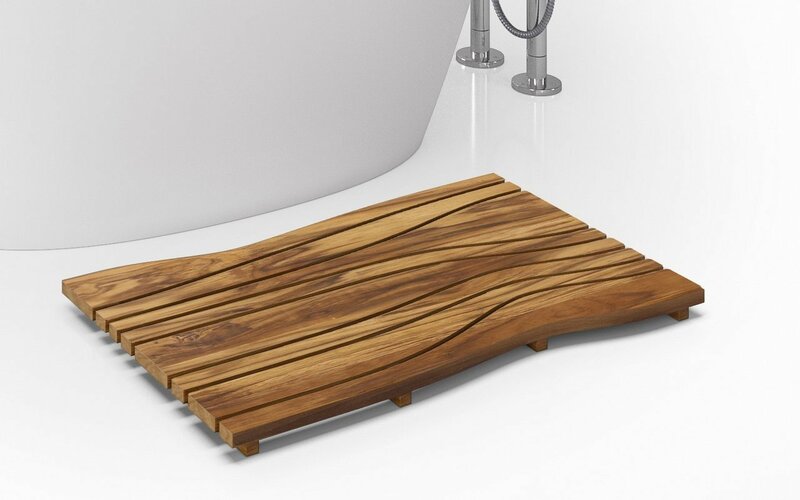 Aquatica has translated this into a stunning, solid wooden piece of bathroom furniture that is warm and tactile, with its own organic oil which keeps it waterproof and prevents water damage and cracking. The rich wooden tones and smooth finish of the wood add a natural earthy touch to your bathroom.